Chinese orthopedic surgeon Luo Shanpeng performed emergency surgeries on 6 patients in a row without taking a break. After the 6th surgery which took 8 hours, the doctor laid his head on the operating table while still holding the arm of the patient he had just reattached and he blacked out. A nurse took the photo and shared on WeChat, a Chinese messaging platform, and it blew up immediately. Seeing this makes my heart ache. Luo works for the No. 6 People’s Hospital of Guiyang in south-eastern China’s Guizhou Province. 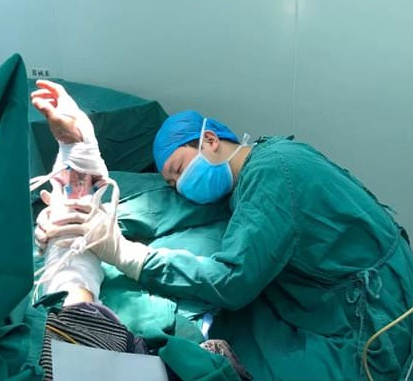 He told Guiyang Evening News that he had already performed five operations when a patient was rushed into the hospital at around 6pm on January 3. The patient’s right arm had been mangled in a meat mincer and nearly torn off from his body.